I’m very pleased with most of what World Quests have brought to WoW. World Quests provide a new twist on the ‘daily quest’ model. In other words, they disguise the same system very well. World Quests are daily quests. There are multiple layers to these daily quests, including the fact that they’re all available for a limited time even within the same day (roughly, some have longer timers). I like how the reward system plays out with items being able to upgrade, and the loot chests from D3-style bounty system act as a great carrot for hoping a legendary pops out and surprises you. What I really dislike is the reputation, resource, and artifact power grinds. World Quests aren’t necessarily to blame for this, but they are being used to disguise how ‘active’ and ‘managed’ this grind has become. We have to gather ridiculous amounts of everything, and grinding these world quests every day is cumbersome. I simply can’t get through a dozen+ world quests every day, AND do dungeons, AND to my Suramar dailies, AND the regular quests I still have to do there, etc. It’s too much. Yep, I’m saying it: There’s too much to do right now, but in a bad way. Why is it bad? Because we’re compelled to feel as though it’s a “must do” activity. You “must do” this to get the upgrade to your ONLY weapon on the expansion. You “must do” this to get access to the best dungeons. You “must do” this to get access to the later parts of the expansion content in Suramar. So while I like this version of daily quests more, it’s still just a better version of the same thing. World Quests are still daily quests. World Quests still make me feel like I must do them or else I fall behind. It’s the “or else” part that I dislike. The act of doing them is mostly fun, which is at least a step up in the right direction. – Gear up for mythics. 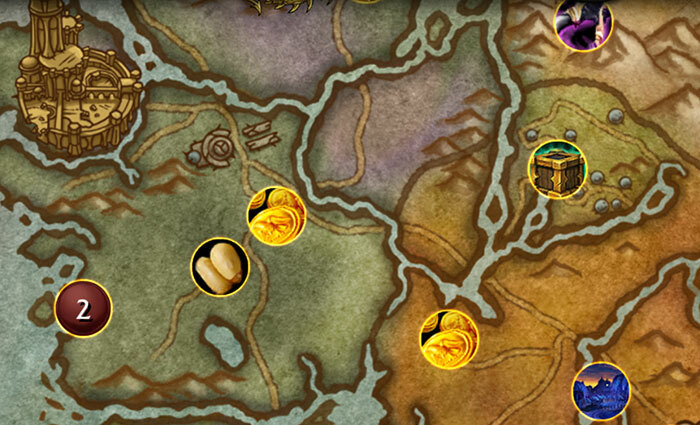 Usually through Objectives (World Quest List addon is your friend), which might include dungeons or the emissary quests because the chest can contain gear. – Get High Mountain rep to improve my blacksmithing though objectives and any normal quests I missed. – Advance my class campaign story. That might include quests (which may or may not overlap objectives), missions (which gate your progress giving you time to do something else) and dungeons. – Advance Suramar rep/story, that includes weekly withered scenario. This makes it easier for me to skip stuff that doesn’t fit my priorities. Or I can play against my priorities but with an eye on available playtime and interruptability. @Kerazi Koder: That’s great advice, thank you. Although I wish I could do everything every day, I have taken to a similar approach. I’m focusing on at least doing 1 random heroic (last night I managed 2), the cache from the WQ bounty, and my class campaign. When I have a little extra time I do some engineering quests and work on my suramar. What I think nags at me is how some people are able to do it all, and already be 850 and already be maxing rep and I’m just like… how the heck do you have a job/life/kids/others and manage that? I know I could do it if I was like I was in 2004-2006 playing 18 hours a day… but that’s just so unrealistic. Artifact Power is good, but understand they have designed the game with catch up mechanics. Those people that are dumping tons of time in doing every quest will only be a week or two ahead of you in progression. Of which that what ~3% more power in one ability, so not a huge deal. Gearing up initially is a big time investment but that will quickly fall away. As you hit 820 getting more gear becomes much slower, and while yes you can dedicate a large portion of your time to it, I wouldn’t suggest you do that unless you find that fun. Bottom line is: We are 10 days into the expansion, no one from our group did mythics the first week. Mythic+ won’t unlock for at least another 2 weeks. The rep grind is real, as was it with WoD and Panda… just make sure you take a step back and understand this is a game to have fun and relax. I like it. You do 4 a day in a certain zone for the big reward. If you miss a day, it will keep up to 3 of those active before you are actually losing one. Doing more world quests than that will reward you but slowly compared to the 4 quest daily. It’s a great balance that should keep 2016 Keen happy while allowing 2004 Keen to have more to do in his 18 hours, progressing but more slowly per hour. The only problem here is that 2016 Keen resents 2004 Keen. 2004 Keen continues grinding for 17 more hours, getting 50~ rep per world quest. IMO, Blizzard really hit it out of the park with this system. The problem is, if you feel compelled to keep up with other people (who play more than you), isn’t the only alternative to design the game so it is simply impossible to make any progress on your character after a certain amount of time per day? @Carson: Nope, they can have a catch-up mechanic. If you can only earn a maximum of 1000 rep per day, and you can’t play every day, and you fall behind two days (let’s say getting 500 rep a day) then you are now 2 days behind without a way to ever catch up. Ill have to disagree with your lack of love for the world quests. As someone who is totally tired of “dailies” I love the system. I can do whatever I want, work suramar, class campaign, do the world quests. I have my choice what I want to do, sure these fools rushed to mythic dungeons , but for what? Most of those people dont have lives like a “normal” working adult. Im loving it so far, and the rep grind is very well disguised with the large rep rewards from the WQ and the kiron tor rewards. Last night I unlocked WQ finally, knocked them all out in a couple of hours, now I get new ones every few days. You dont have to do them all same day which is even better! @Wonderwyrm: I like them for the same reasons you do. 🙂 Hence the sentiment that they are an even better version of the daily quests. I have additional qualms with them, mainly their attachment to rep and gating content. This article pretty much sums up how I feel… I feel stressed when logging in.. there are so much I wanna do and dont know where to start and what to complete before my free time ends..
Timers needing to be met, we’re not why EQ or WoW worked in the beginning. Time spent sure. Smart time spent even better. But I was not on a dog leash to log in at a certain time every day to do something trivial. The whole genre has lost its way but it might not matter because…phones.